Style: This is a large country house in a very private setting. Architecture: Separation of the entertainment, living and bedroom areas provide the quiet or privacy wanted. evidence on the floor of where the walls have gone, leaving visitors perplexed and amazed when the walls return. Nature: Glass stairs run through the middle of the fish aquarium giving a feeling of being under water with the fish. Lighting: The pool sides are all glass, throwing water-filtered sunlight into the downstairs areas. Sustainability: The aquarium is part of an aquaponics system providing fresh vegetables and fish for the occupants. 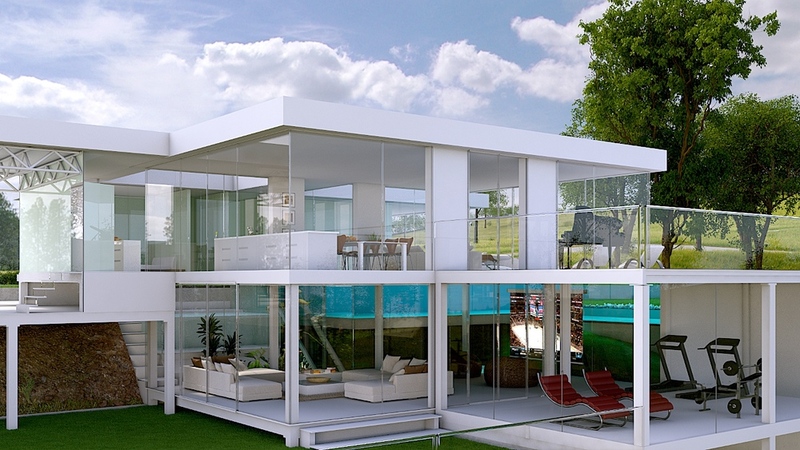 Flexibility: The all glass garage is designed to double as a function or party area. Minimalism: All the doors are automated. There are no door handles. Disclaimer: All images and scenes may be conceptual or based on current development plans.